Living abroad and dealing with finances, whether it be a simple currency transfer from my U.S. account or a wire transfer from a client’s account to mine, can be a bit of a hassle. Those irritating fees and cuts banks and services take – I mean, what’s up with that? You’d imagine that with the disruption we have seen in the tech world, the financial market would be on track to transform not only mobile payments, as we’ve seen with Apple Pay, for example, but with currency exchange. Give me a service that cuts the fees and commission banks are charging, and I’m a happy woman. It seems, though, that the fintech industry is right on track, in fact. I happened to meet a couple of young entrepreneurs who were eager to take advantage of the pain consumers are experiencing with regard to currency transfer. These sharp guys started their company, CurrencyTransfer.com, the world’s first online marketplace, helping individuals and businesses transfer money abroad up to 85% cheaper than the banks. 1. So, tell me, what is CurrencyTransfer? First of all, thanks so much for the opportunity. CurrencyTransfer.com helps individuals and businesses transfer money abroad up to 85% cheaper than the banks. We’ve built the world’s first online marketplace, matching our users with the most competitive international payment quotes. You can think of us a little like the Expedia for Currency. For the first time, we put customers in control, with multiple FCA regulated suppliers fighting to win your business – on your terms. 2. Now that the Fintech industry is booming, you certainly have some competition. How will you take advantage of this growth? What aspects of your company and product give you a competitive advantage over the others? Our product has clear differentiation. We’re not a bank, we’re not peer-to-peer and we’re not a broker. We aggregate live rates from multiple suppliers in one, transparent venue. Conceptually, we’re an Expedia for currency. But really, we’ve democratized capital markets aggregation technology and brought it down to the everyday individual and medium sized business. CurrencyTransfer was built on three core principles: Transparency, Access and Customer Choice. 3. Where do you think and the FX marketplace will be 5 years from now and how do you see CurrencyTransfer leveraging the market? We aim to aggressively build out both sides of the marketplace (users and currency suppliers), helping customers in any country access fair and transparent international payment quotes. Internationalization is key in a $21 trillion-a-year space. Whether you’re an importer or overseas property buyer in the UK, USA or Australia, we want to offer the most comprehensive range of choices and value to our users. In the back of our minds, we also want to think at how we can delight our customers with other aspects for an SME to better run a treasury function. 4. What do you define as good user experience for the Fintech, particularly in Foreign Currency Exchange? Banks don’t really get customer experience. This is where I truly believe that the most ambitious of FinTech startups can really challenge the banks. In the case of CurrencyTransfer, we try to make the platform 100% free from over complicated and unnecessary foreign exchange jargon, which can confuse users. For example, we clearly and transparently show the mid-market rate, side-by-side with your rate. If you go to a supermarket, you leave knowing exactly what you’re paying for your apples, bananas and pears – to the last penny. Foreign currency exchange should be no different. Within an elegant user experience, three clicks from setting up a trade, comparing rates and booking a transfer is our aim. 5. What were some of the toughest challenges you faced in your initial product development process? Foreign currency exchange is a regulated environment and the challenge between meeting all the compliance hurdles for activation, and delivering an elegant and fast user onboarding journey is a real optimization challenge. Our values are clear: we are only interested in offering live currency rates (rather than guide rates) from multiple money transfer suppliers. In order to offer live rates and be 100% price transparent, you need to have a customer onboarded with multiple suppliers in one hit. It would have been awful to direct customers to multiple suppliers’ sites, to fill in the same long compliance and uploads, and then come back to the CurrencyTransfer platform. We embarked and successfully completed a journey to build the world’s first multi-supplier compliance form, activating you with many non-bank FX suppliers in one elegant onboarding form. It’s our secret sauce (which we still continue to optimize). 6. If you could give a Fintech entrepreneur one piece of advice before building their own Fintech startup, what would it be? Read ‘The Lean Startup’, get out of the building and speak to potential early adopters about your product, even before the first line of code has been written. You don’t want to build something that nobody wants. 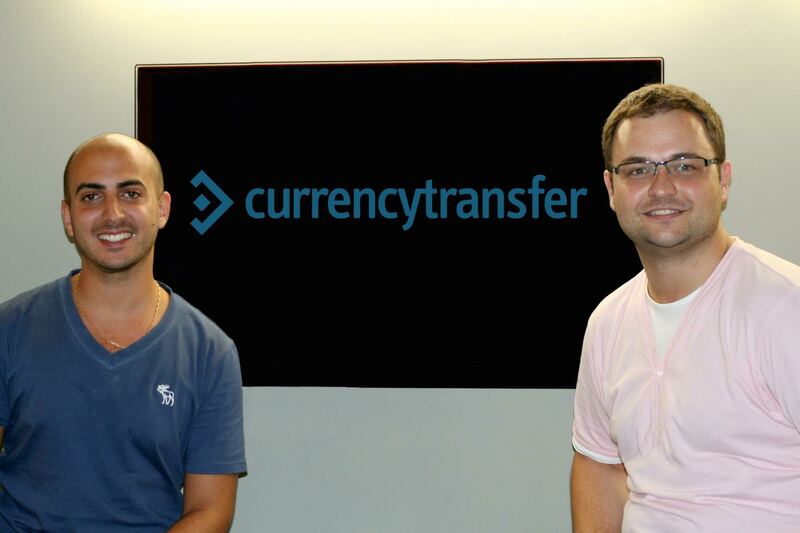 Daniel Abrahams (left) is the Co-Founder and CEO of CurrencyTransfer.com. Daniel divides his time between London and Tel Aviv. You can find him on Twitter.